A short while ago, I did a quick search for speech recognition implementation within UE4. Since I came up empty, I decided to port PocketSphinx into a plugin. This is a rough WIP, and any advice would be appreciated. 1) Copy Content and Plugins from https://github.com/shanecolb/sphinx-ue4 into your project folder. 2) Startup the project, and emulate the blueprint from Screenshot2, for an actor of your choice. Event Word Spoken is an event that is triggered when a detected word is spoken. Note:Ensure that a list of words you wish to recognise are added as an array to AddWords. Otherwise, no words will be recognised. False positives do occur, eg. speaking triangle will trigger translate in my example. This is more than suitable for my needs. I haven't had a chance to use this, but Great Work! do you know what happend ? @s67Zero6 - It looks like some kind of loop. If you have the plugin source there try and put some breakpoints and see what's happening in the actual plugin code (in Visual Studio). The Github project should be public, let me know if it is not. Rather than a few screenshots, i`ll add a link to the project file of my example later today. Okay, please try extracting to your project directory, and startup/run the project. Just tried it on a machine without a mic, crashed when I hit Play in the editor. I'll try running it remotely on my machine at home and report back (which does have a mic set up). Edit: Confirmed working on a machine with a mic. Seems like there's probably somewhere you can check so that it won't crash if the mic is not plugged in. Last edited by n00854180t; 10-16-2015, 01:37 PM. I have locally fixed the issue of the plugin crashing when no microphone is detected. I am still working on the issue of game thread related actions crashing Unreal Engine. I should hopefully have a release with both fixes up either today, or at worst, tomorrow. Last edited by ShaneC; 10-19-2015, 10:13 PM. - AddWords method has been removed, when Init is called, the word list is passed in. - Calling Init multiple time (on the SpeechRecognitionActor) causes the existing initialisation to end, and for the worker to re-initialise. - Init and Shutdown properly respond with success/failure. Please take a look at the sample project I have added. If you have any suggestions or encounter problems, please let me know. In the future, I certainly wish to improve the speech recognition speed, and the speech recognition accuracy. Last edited by ShaneC; 10-20-2015, 08:12 PM. @ShanceC - Awesome work man Thanks so much for doing this. One feature suggestion I have is to implement one or more of the other modes of recognition - e.g., the phoneme extraction one (which is useful for lip sync for instance). It's certainly something I plan to look into. Unfortunately, I don't have tons of time. If you don't end up implementing the other modes, I'll probably have a shot at it and do a pull request. Last edited by n00854180t; 10-20-2015, 08:44 PM. Alright, so I spoke too soon :P Found a bug! It doesn't happen if you just say one word at a time with a pause in between, especially if it's stuff on the word list. You have to just give it a string of normal speech for the error to happen. Note that this was using Selected Viewport/Play in Editor - I don't know if that matters versus "Standalone Window" mode. This also illustrates a problem I didn't consider - the "Word Spoken" event fires even if the match is very poor (i.e., the user said something not in the word list at all). It seems to me we need a way to filter out matches with a low probability so that the word-list actions aren't being fired off all the time, even when the user is saying something not on the word list. Implementing the phonetic recognition could also help with this - allowing the user of the plugin to compare the phonetic recognition word to the word list and reject it if it's not a good match. That said there may be a cleaner way provided by Sphinx, such as a way to get at the probability of a word-list match. 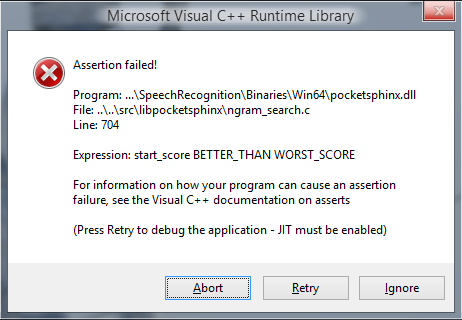 Edit: BTW anyone that sees this error pop up - do not click Abort, or the entire editor will go down. Ignore will let you continue without crashing stuff. Last edited by n00854180t; 10-20-2015, 11:05 PM.